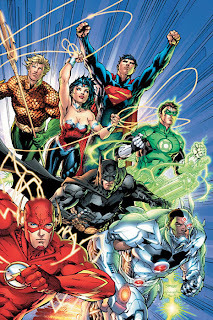 Reactions to DC's Linewide Reboot #3: Jack D. Kammerer Jr. This one comes from Jack D. Kammerer Jr., who runs Animotions. He has been in the independent scene (you can actually find the stuff he talks about if you Google well enough), and thus has a different, more macro view of this entire thing. As such, he hardly talks about the reboot, but chooses to use it as a launching point to talk about some of the larger issues in this industry. I can't honestly see a better way for comic book shops to go than what he suggests here. So here we go. by Jack D. Kammerer Jr. The dynamics of the Industry completely changed 12 years or so ago, as a result of variant covers and other gimmicks in an effort to try to increase comic collectability and profit margins by trying to increase issue/price guide value to an already stressed market. By that time the industry was already suffering due to console gaming entertainment, new readership was seriously down resulting in closures of "Mom and Pop" comic shops (which quickly became Tobacco stores), as well as, Heroes World and Capital City Distribution which resulted in Diamond Distributions "Monopoly" and heavy handed practices against the Independent Press Industry. Time and time again, we've seen this industry suffer due to oversaturation in a decreasing market and now, with their latest announcement, DC is ramping itself up to do it again. The BIGGEST hurdle that the comic book industry has to overcome right now is the disenchantment of yesterday's readers. Many comic book readers and collectors were brought into the world of comics from someone else... by word of mouth out of a desire to share magical and fantastical worlds with someone else. My father introduced me to comics, his father introduced him... but I haven't really introduced anyone myself. Why? Because of the lousy marketing and gimmick schemes the magic of the Industry was lost to me around the mid-nineties. I stopped collecting and I was no longer interested in even looking at a comic book. I was in the Independent Press area, I worked and clawed my way to get my books done, trying everything I could to get my books published and out to the public. Distribution was pretty much IMPOSSIBLE as Diamond Distribution took over main distribution and started leveling insane advertising and distribution costs, as well as, fines against companies. The Internet was young, but gave individuals a platform to speak out against the unfair practices and A LOT of the Independent Press (and some artists/writers from the Big Three also) used that platform to air their grievances and people listened... further damaging the industry. Add to the fact that there are very few comic book stores out there and many of those that you are able to find often resemble an overstuffed "flea market" of used toys and other items, which doesn't help much either. Package that up with the same old, same old marketing practices and advertising schemes, it is pretty easy to understand why the industry is where it is today and why potential consumers are elsewhere. Rather than looking to take advantage of untapped markets and trends, the large publishers are demonstrating just how out of touch they are with the consumer base and the Industry they seek to revitalize. They can never seem to raise their eyes from their profit margin lines long enough to actually look at the market that they depend on for those profits. Eventually, you'd think, that those in the position of power would realize that they need to evolve their market plans with the current market and times. That relying on old strategies, such as special crossover events and character deaths and resurrections, while they might've worked in the past, no longer have the same impact or effect that they once had. Rather than oversaturation of titles in a stressed market and consumer base, they really should focus on streamlining their titles down to level that supports consumer income and reduce issue print runs which would increase individual issue value and driving up collectability. In doing so, they would reduce printing and distribution costs, as well as, losses associated in those areas with failed titles with a very low consumer/reader base resulting in higher profit margins and also insuring turnstile sales on days of distribution from a consumer base looking to pick up their favorite titles before they sell out. The US versus THEM mentality of the companies need to be abandoned beyond just crossover titles. Imagine if Marvel, DC, Image and other companies spent some of the profits into heavy product advertising. Picture, if you would, how it would be if all of them and some of the Independents were able to pool resources together to open large, franchised store chains that were spacious, cleanly, complete with a Marvel Section, DC Section, Image Section, Independent Section with booths with signage and where Saturdays and Sundays (once or twice a month) could be treated like a mini comic convention in each store hosting guests, signings and the occasional comic book hero appearance for little kids... and then add heavy Internet, television and radio advertising into the mix, as well as, service announcements like the classic "Reading is Fundamental" spots... something that is catchy and will stick in children's heads. The bottom line is the industry really needs to reinvent itself. It is time that publishers big and small should be working together to bring old readers back and excite new readers. The problem really isn't video games, Kindle/iPad and the Internet. Sure, it plays a minor role, but the Manga industry has the same challenges, and even more, overseas... but aren't nearly suffering as much... so why are we?